Squeeze the juice of four lemons, separating out seeds, and place in a large pitcher that has been pre-cooled in the refrigerator (this will make the pitcher even more frosty-looking, and keep the lemonade cooler longer). 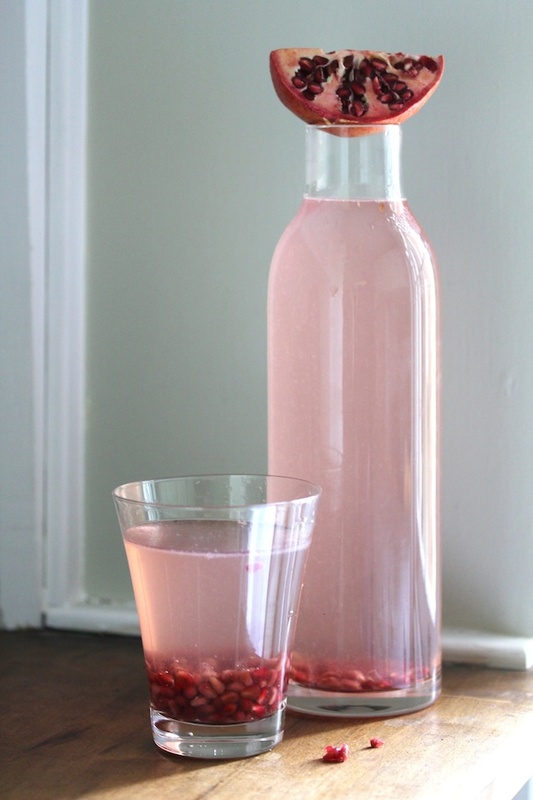 Add one cup of sugar and three one-liter bottles of sparkling mineral water, adding the sparkling water last (that is what makes it particularly fizzy). Stir until sugar is dissolved. Garnish with lemons and serve over plenty of ice. I have lately been using several round ice cube molds to create one large, spherical ice cube, which I think looks more festive (and I used one on the top of the bottle so you can see exactly how they look. The molds are also an Amazon purchase, available here. In a large pitcher, pour lemon juice, sugar and water. Set aside about one quarter of the pomegranate seeds for garnish, and crush the rest in a blender or food processor. 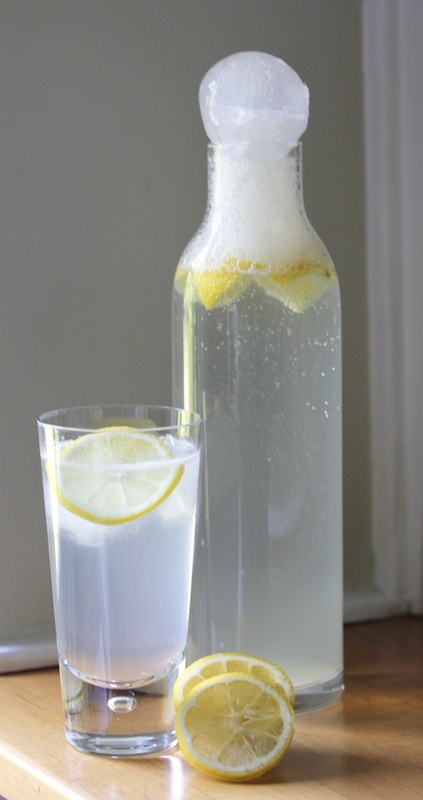 Strain any excess pulp from the crushed seeds and pour into lemonade. Stir well until sugar is dissolved. Drop remaining unblended pomegranate seeds into pitcher. Pour over glass of ice and serve. Note: Lavender extract is not the same as lavender essence. The extract is edible; the essence is for external use only. You can find the extract in cooking stores and in the baking section of the grocery store. In a large pre-chilled pitcher, pour in the lemon juice, water, sugar, and lavender extract. Stir well until sugar is dissolved. 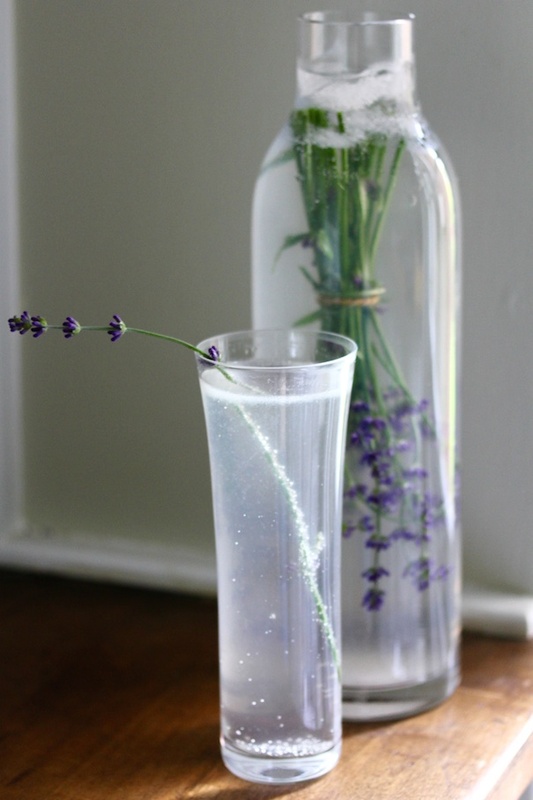 Take a small bunch of fresh lavender and tie together with a bit of kitchen string, and drop into the lemonade. Add ice on top of lavender bundle to keep it from floating to the top. The taste of lavender is more pleasing to some than others. If you really like it, you may want to add more lavender extract to the lemonade; it’s a matter of personal preference.